Enhance your deck with both a rustic theme and movement using this Ancient Graffiti Kinetic Dual Wagon Wheel Deck Spinner. Adding a wind sculpture to your deck brings a bold look to the setting, and the two generous toppers on this piece lend a western hint to it. These 14" diameter accents evoke wagon wheels, thanks to their perfectly circular frames and interior spokes. The spokes, crafted from metal slats, each have a slight twist to easily capture wind, creating a fantastic spinning effect. A 19" tall, twisted iron stake supports these accents, and its base clamps onto wooden deck rails from 0.5" to 2.5" thick. The brown tone throughout the unit furthers the rustic feel, while a few verdigris accents add dimension. Made from iron, this adornment is sure to remain lovely and durable for several seasons. 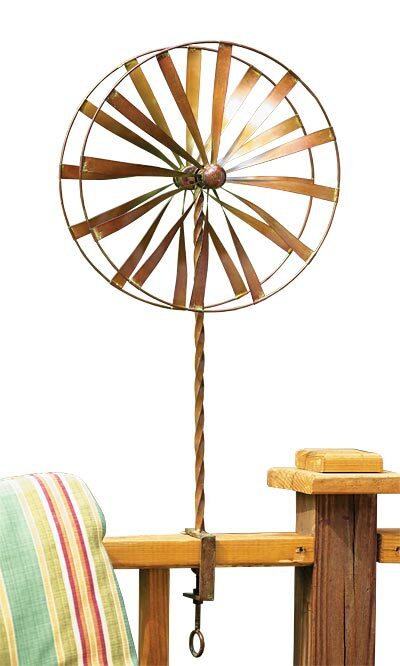 Bring a pioneering look to your deck with this Kinetic Dual Wagon Wheel Deck Spinner. Assembly required. Availability: 3 in Stock. Ships from OH within 24 business hours , 1 available at this price!